A few days ago I posted a snippet of the new Beginner's Watercolor Workshop DVD on Youtube. You can watch the snippet by clicking HERE. Be sure to let me know what you think. 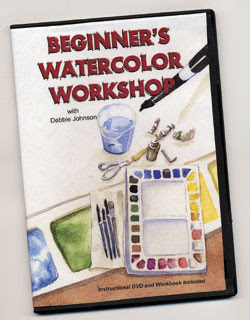 If you would like to order the DVD you can order from my website: http://watercolorworkart.com. I also wanted to invite the locals to a wonderful gallery show coming up at Art & Antique Studio Gallery in the Art District of Melbourne. The gallery is at 1419 Highland Avenue one block south of the Brevard Art Museum. Every first Friday of the month the Art District hosts a Gallery Walk from 5:30 - 8:30 PM. There are also some very nice restaurants in the area, so you can enjoy the food, live music, and art in several galleries. Art and Antique Studio is hosting an invitational show called Art In Miniature. Over 100 pieces of framed artwork came in for the show, which boasts several awards, and some amazing artwork. Each piece of artwork measures 12 by 12 inches or less, including the frame. Stop by on the First Friday Gallery Walk, or anytime throughout the month of June. It will be a real treat!